Today I found out how to drastically increase the life of your shaver razor blades, such as Gillette or Schick brand razors. This trick is incredibly simple and just as incredibly effective. It will also save you a nice chunk of change over time and make all your dreams come true. 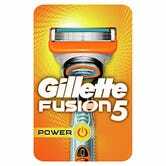 For instance, Gillette Fusion Brand razor cartridge sets typically will run you about $27 per set of 12, which will typically only last you a few months and less if you actually go by their expiration "strip" in determining when the cartridge needs replaced. With the below method, I have now gone about eight months using the exact same cartridge and the blades on the cartridge are as sharp as when I first popped the cartridge on. I have no idea how long this will keep up, but now a package of 12 cartridges is apparently going to last me at least 12 years or more. This is a savings of around $70 a year over my previous expenditures on these cartridges; so then a savings of close to $840 over the course of 12 years or so and possibly will last more years depending on how long these things will stay sharp with the below method (I haven't yet found the upper limit). You could then use this $840 to buy $840 worth of bacon, which should of course make all your dreams come true, assuming your dreams are all bacon related; which lets face it, who's aren't??? Before or after you shave (I prefer before so that the blades are dry), place your jeans on a hard flat surface; then run the razor up the pant legs about 10-15 times quickly; then repeat running it down the pant legs 10-15 times quickly. No need to press that hard, but a little pressure is necessary. In both instances, you want to point the top of the razor in the direction you are rubbing the shaver on the pants. In other words, don't "shave" the pants; point the razor the other way, so that the blades glide over the surface of the jeans and don't try to cut them. The threads on the jeans then will very effectively both fix any tiny bends in the blades that inevitably happen and will also sharpen the blades on your shaver cartidge. For an already dull blade, you can sharpen it up pretty effectively by doing 50-100 swipes both ways to get it back up to "like new" condition, but only 10-15 times swiped both ways should be necessary to maintain sharpness.